BBC announced that it would distribute about 1 million Micro bit computers to school children aged 11 to 12 years old across the United Kingdom. The tiny computer was unveiled during a conference in London this week where future plans to be implemented in October were discussed. Micro bit project had been introduced early this year as a sub-project of Make It Digital initiative. said Tony Hall, Director BBC. The BBC Micro bit is a joint project of a number of leading companies including mainly ARM, Farnell, Microsoft and Samsung. The partners of this project hope that this micro-computer will have an impact on the next generation of children, imbibing in them an urge to understand computer basics and programming languages. Micro bit will be commercialized this October when free units of the device will be offered to students between the age bracket of 11 to 12 years. 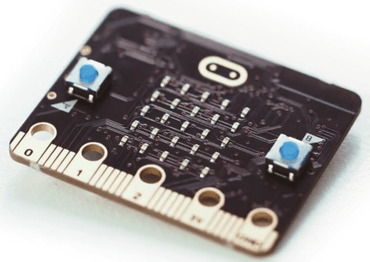 Microsoft has a special contribution in the development of Micro bit i.e. the development of browser-based programming interface. The Micro Bit is 4 x 5 cm (1.6 x 2 inches) in dimensions, but this tiny gadget wraps lots of features in it including a grid of 25 LEDs that form a particular display pattern when programmed. It also has 2 programmable buttons and a built-in accelerometer and a compass. The Micro Bit can link with other devices either through five input/output rings or wirelessly via Bluetooth. BBC expects the upcoming generation to move digitally and Micro bit is specially designed for children who are home-schooled so that every child can have his hands on it. This is a great initiative by BBC and the partner companies as we take another step towards a digital world.